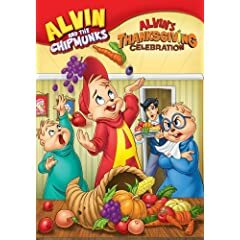 On September 23rd Paramount Home Entertainment will release Alvin and the Chipmunks: Alvin’s Thanksgiving Celebration on DVD! Celebrate Thanksgiving Chipmunk style with these fun-filled original episodes from Alvin and the Chipmunks. On this DVD, the world-famous Chipmunks, Alvin, Simon and Theodore perform in a play, recall famous moments in American History, take care of a kitten and face the marriage of Dave! The DVD includes: A Chipmunk Celebration (Thanksgiving), Food For Thought, Cookie Chomper III, and Dave’s Getting Married. About Paramount Home Entertainment: Paramount Home Entertainment (PHE) is part of Paramount Pictures Corporation (PPC), a global producer and distributor of filmed entertainment. PPC is a unit of Viacom (NYSE: VIA, VIA.B), a leading content company with prominent and respected film, television and digital entertainment brands. PHE is responsible for the worldwide sales, marketing and distribution of home entertainment products on behalf of various parties including: Paramount Pictures, DreamWorks Studios, Paramount Vantage, Paramount Classics, Nickelodeon, MTV, Comedy Central, CBS, PBS and Hasbro and for providing home entertainment fulfillment services for DreamWorks Animation Home Entertainment. your entries using the comment form below. Contest ends on 3rd November, 2008. Contest update: Contest is closed. See the winner’s page.